The Ruth Mott Foundation has made a significant commitment: to redirect their focus to north Flint neighborhoods. With the Community Engagement Office’s new location at the Christ Enrichment Center in north Flint, they are on the front lines of economic and social change. 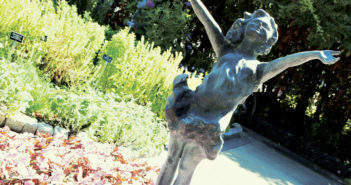 Through a centralized, place-based approach, their philanthropy – as always – is geared toward community support; their strategic plan will span from 2016 to 2020, and is based on research and reflection from the community, in an effort to create safe, healthy and financially secure neighborhoods. The Foundation has defined north Flint by city limits on the west, north and east, and Flushing Road, 5th Avenue, Longway Boulevard to the south. Based on this definition, north Flint makes up about 55 percent of the city’s residents. “The Ruth Mott Foundation Board of Trustees decided to focus on north Flint because it’s an area where we feel our efforts can make the biggest difference,” Lindsey says. As the planning process to redirect the Foundation’s focus began in 2015 (before water issues came to the public eye), they wanted to heavily and actively involve the community’s voice with their thoughts and ideas about what they would like to improve in the area. 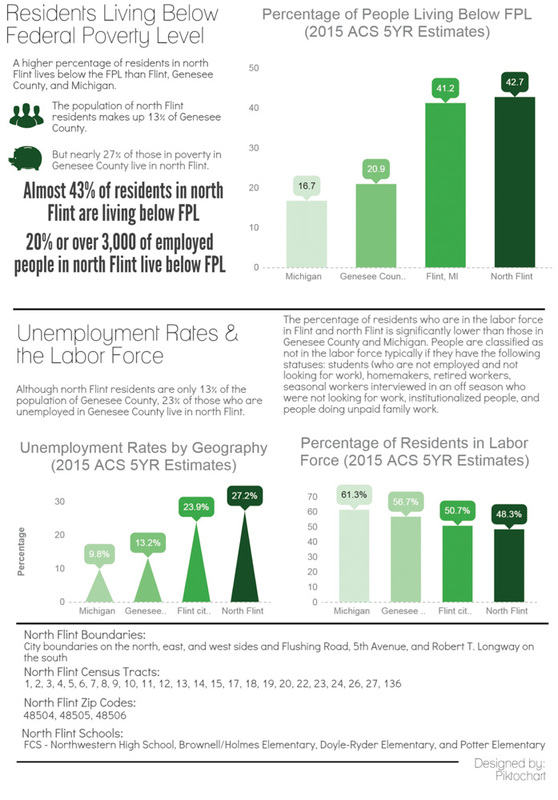 The incomes of Flint and north Flint residents are significantly lower than incomes for Genesee County and Michigan residents. 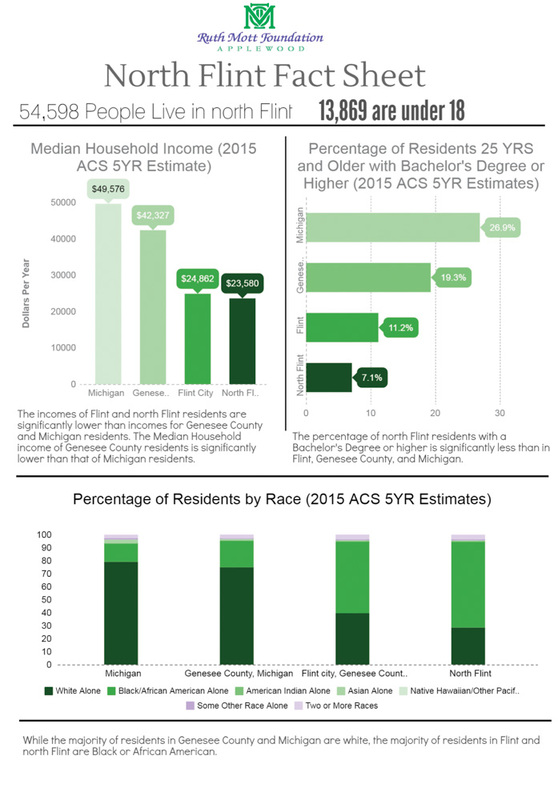 The median household income of Genesee County residents is significantly lower than that of Michigan residents. Residents of north Flint did share their concerns and ideas, and the Foundation listened, understanding that those who live there – who witness the issues firsthand – of course, are the ones who know where improvements need to be made. 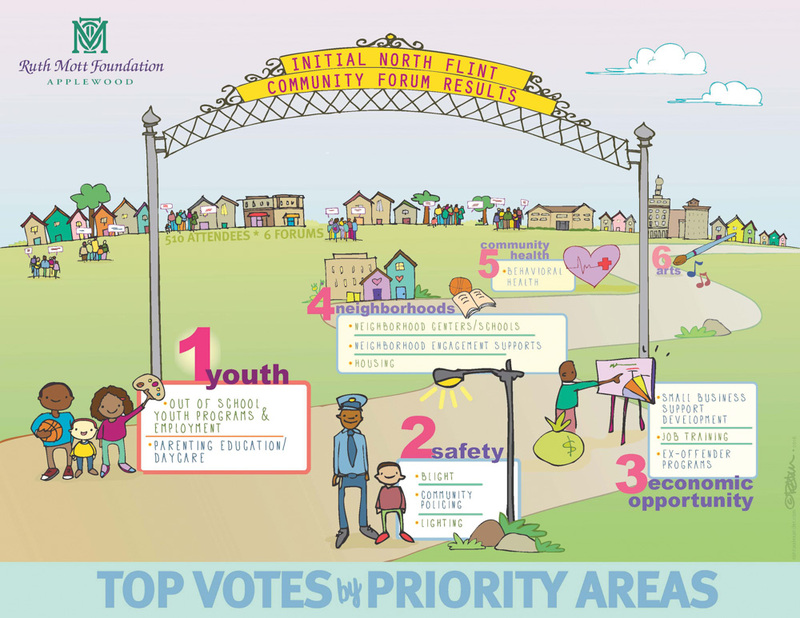 After hosting eight community forums at different Flint locations and listening to more than 500 participants, the Foundation and residents landed on their four major areas of focus: youth, safety, economic opportunity, and neighborhoods. Any and all grants must somehow address one of these four areas, with the exception of Flint water-related grants. “We also asked residents to give us at least one piece of advice as we embarked on our north Flint strategy,” Lindsey says. “We heard a variety of opinions that we took to heart, including: ‘Start with providing safe locations for our youth to learn and be given opportunities to get exercise,’ and ‘Continue to seek community involvement.’” For youth, grants will focus on out-of-school programs and employment, as well as parenting education and daycare. Safety issues encompass blight, community policing, and lighting. Economic opportunities include small business support development, job training, and ex-offender programs. Neighborhood changes include public centers and schools, engagement support, and housing. Although health and arts did not rank as highly as other areas, health and arts will still be integrated into the grantmaking process as secondary issues. As soon as the Foundation announced its change, they immediately saw a more targeted investment in north Flint. “Genesee County is a really big civic engagement community,” says Tryphena Clarke, Community Engagement Officer. “Already, many efforts have brought other individuals into the community to support the work going on.” She believes that as the residents become more knowledgeable, it can bring immediate results, as well as long-term change. The location of the Community Engagement Office at the Christ Enrichment Center in north Flint allows and encourages residents to voice their concerns and ideas. Clarke, who has lived in Flint her whole life and started in her position in April of 2016, finds the approach to be in her blood. The new north Flint office that opened in December is about three blocks from her home. 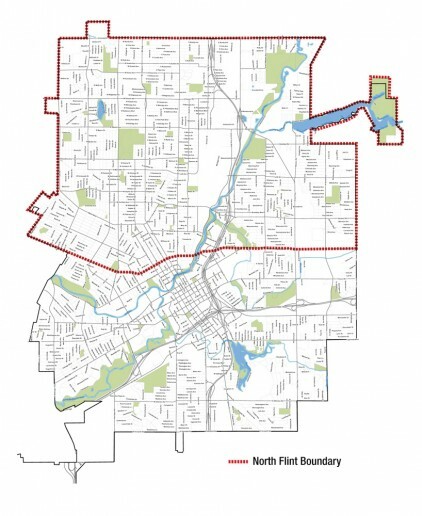 Clarke is a liaison for the Foundation and north Flint; part of her job is to speak to residents, and the other part is to update the Foundation on any other work in north Flint. 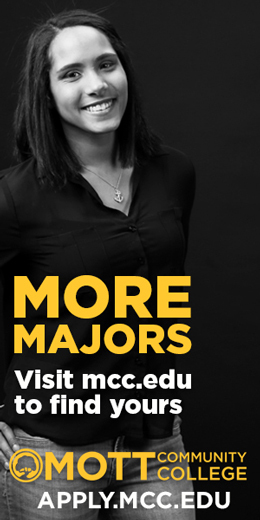 Clarke’s most recent project was being part of the Flint Grassroots Initiative, organizing door-to-door water distribution, and collecting data with surveys about service gaps for Civic Park Neighborhood. “It was exciting,” she shares. The Foundation views each grantee as a partner, conferring and collaborating with government, educational institutes, the local funders and the other organizations, to make sure that work done in Flint and Genesee County is not being duplicated. And though it’s in the beginning stages, they are already seeing positive effects, such as the development of neighborhood hubs at Berston Field House and the Urban Renaissance Center at Joy Tabernacle. In sum, the Foundation’s approach will engage the community, invest in its priorities, facilitate best-practice sharing, integrate Applewood Estate, support innovative solutions, measure their impact and adjust, if necessary. Based on the U.S. Census’s 2015 estimates, 54,598 people live in north Flint; of the population, 13,869 are under the age of 18. Information below is also from the U.S. Census.